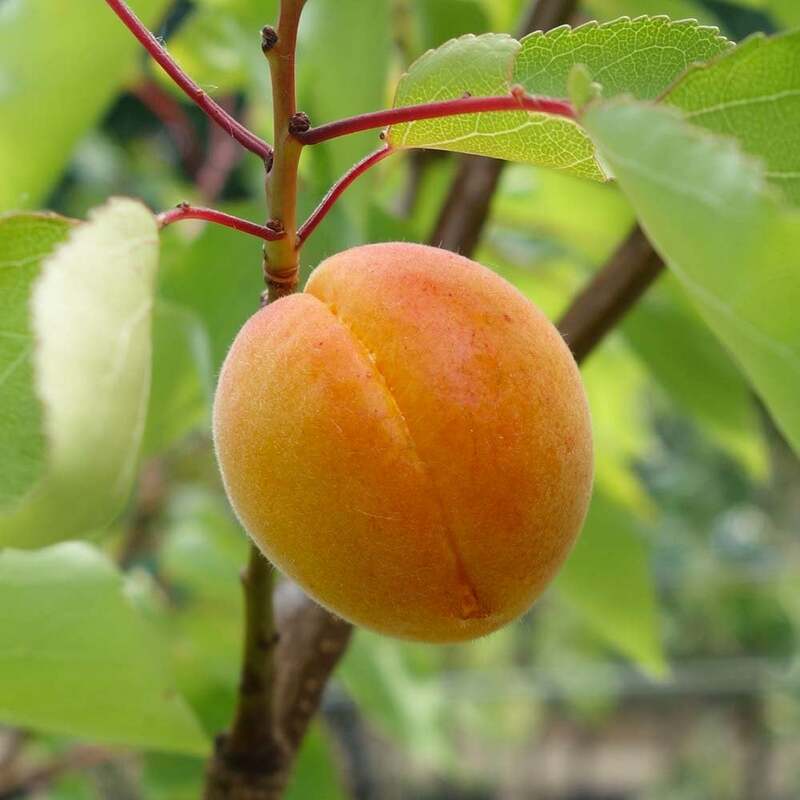 This hardy variety of Apricot tree will grow well in the UK climate and produces masses of tasty apricots with a golden coloured skin and sweet flesh. You needn't worry about pollination, as Golden Glow Apricot is self fertile, so only one tree is required. It performs very well as a free standing tree but is also good trained onto walls as this helps to avoid spring frosts. These trees are grafted onto Torinel rootstock which is a specialist Apricot rootstock which gives improved fruit yield and good fruit size. Interesting fact: Golden Glow Apricot was discovered when it was found mysteriously growing by chance in the Midlands in 1985. *This is an indication of the un-pruned height of this variety of Apricot in 10 years. Variations will occur when different factors are introduced such as planting position, pruning, geography etc. Apricot trees should be spaced at approx. 3 metres between trees. Our pot grown Golden Glow Apricot trees can be planted at any time of the year, whereas bare root apricot trees can only be planted between November and March. Prepare your planting site by removing all weeds and grass within a metre of your desired planting hole (or holes) then dig a square hole as deep as your root mass and approximately 3x as wide. To help your tree establish more effectively, we advise applying root grow (sprinkle in the hole for pot grown trees or prepare and apply the gel mixture for bare root trees), especially if you have poor soil. Gently loosen the roots and place into the planting hole. Using 50% of the original soil and 50% compost, fill in the hole and firm around gently. Make sure not to bank the soil up around the collar of the tree. We recommend planting apricot trees using a stake and tie kit and rabbit guard. For further information, visit our advice section. If you’re planting in spring, summer or dry weather, water well and regularly for the first few months. Make sure to keep an eye on young apricot trees and increase watering if there are extended periods of hot or dry weather. If you’re planting in autumn, you may only need to water your tree a little. Once you see the fruit begin to swell, water again. We stock a range of irrigation kits to help. Unlike some of our other fruit tree varieties, apricot trees should not be pruned whilst dormant. The best time to prune your apricot tree is after the coldest part of the winter has passed but before they start to flower. February is normally a safe time, depending on how severe the winter has been. Apricot trees require quite hard pruning and should look a little gappy but will soon improve once the flowers come to life in early spring. Apricot trees fruit on 1 year old wood so the pruning technique for these trees is sometimes referred to as ‘replacement’ i.e. replacing old wood with new wood. When pruning your apricot tree, you should aim to have between 3-5 main branches, forming an open, vase-shape. Remove any old shoots (grey in colour) as they will not produce fruit. Also remove any damaged, dead or diseased branches. Make sure the centre of the tree is open, allowing air and sunlight to reach inside. The branches that are one year old will be pinky red in colour and should be trimmed back to approximately 45cm in length.